Peter Canavan has left his post as Fermanagh manager. 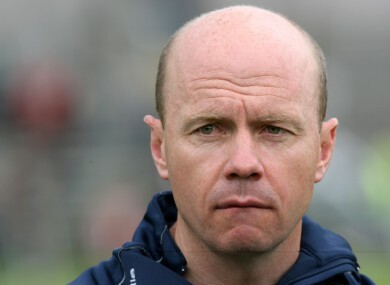 TYRONE GREAT PETER Canavan will not stand for reappointment to the role of Fermanagh senior football manager. The All-Ireland winning forward has spent two years in charge of his neighbouring county, but last night agreed on an amicable split with the Ernesiders. “I will not be putting my name forward for the post of Senior Manager for the 2014 year,” the Errigal Ciaran man said in a statement released late last night. Canavan added credit for the manner in which the squad had dealt with the tragic death of team mate Brian Óg Maguire almost one year ago. “The players’ commitment, attitude, willingness to work and improve themselves deserves special mention. Also in dealing with very difficult and sad issues off the field they displayed maturity and outstanding loyalty to their team mate and friend. “Fermanagh County Committee thank Peter and his entire backroom team for all their hard work and commitment over the last two years and acknowledge the progress made in respect of their work with the county team. Email “Peter Canavan steps down as Fermanagh boss”. Feedback on “Peter Canavan steps down as Fermanagh boss”.